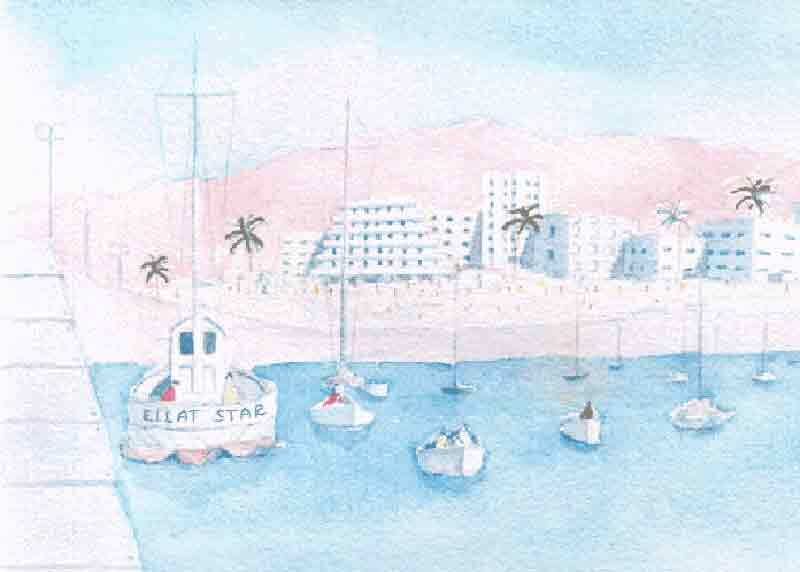 Eilat is situated at the southernmost point of Israel, on the Red Sea. The town has lots to offer: a perfect climate; a beautiful sea with every kind of sea sport available and coral reefs with magnificent fish; the Red Sea Underwater Observatory Marine Park with its many attractions; the Dolphin Reef where the dolphins are free to leave but choose to stay; trips into the desert; a paradise for birdwatchers who come from all over the world, in spring and autumn, to observe from close up the millions of birds that fly over on migration between Europe and Africa. Eilat is but a few hours drive from the Dead Sea, Jerusalem and Tel-Aviv and borders on Jordan and Egypt. As well as all this, it is a haven to many talented artists. Please take the time to look at some of their works of art... you will not be disappointed! Please see the new addition: The Fish Statues of Eilat.